Dr. Rovner grew up in Washington, D.C. He attended college at the University of Maryland, earning a B.S. in Zoology in 1975. He completed his M.D. degree at the University of Maryland in 1979. Having had enough of the East Coast at that point, he moved to California for General Surgery Internship and Orthopedic Surgery Residency at the University of California at Irvine from 1979 to 1984, and then completed a Fellowship in Spine Surgery at USC-Rancho Los Amigos Hospital from 1984 to 1985. He became eligible for board certification in 1987, passed the Orthopedic Surgery Board exam that year in the 99th percentile, and has re-certified at 10-year intervals since. Upon completion of 14 years of medical training, Dr. Rovner started in private practice in the East Bay in 1984, and has been here serving patients from Oakland to Livermore since then. This includes volunteer time at CCS children’s clinics, volunteer time for scoliosis screening in local school districts, and volunteer time as team physician for one of our local high school football teams. He has been on the volunteer clinical faculty of the University of California at Davis School of Medicine since 1998 and is currently Assistant Professor of Orthopedic Surgery, having spent several years in the Department of Spine Surgery there. 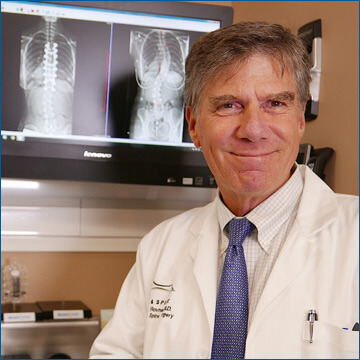 Dr. Rovner’s professional interests include contributions to the science and practice of spine surgery in the form of original patented implants and techniques. He designed an innovative crosslink that connects vertical rods used for fusions, while preserving the normal anatomy, lessening the risk of levels adjacent to the fusion breaking down, requiring later revision surgery. While taking this from design to patent protection to FDA clearance, quality control, manufacturing and clinical use, Dr. Rovner completed a two-year on-line MBA degree at George Washington University, graduating in 2010. That year he patented a new surgical technique for the improved correction of the rotational component of scoliosis that causes the visible deformity that we recognize as the asymmetrical “rib-hump” of scoliosis. This improved surgical technique has been used successfully on dozens of adolescent and adult scoliosis patients since then. While not working, Dr. Rovner enjoys spending time with his family. He met his wife in the school cafeteria in 1975 at the University of Maryland, where she was attending Pharmacy school. They have a daughter who holds a Ph.D. degree from Yale in Molecular Genetics and Synthetic Biology, and is currently a post-doctoral student at Harvard Medical School. His son graduated from UCLA with a Molecular Cell Biology degree and is a biotech consultant on the East Coast. Family time includes golf, skiing, scuba diving and staying connected to extended friends and family across the country. Dr. Rovner has been in practice with Vikram Talwar since 2005. Together they created Disc and Spine in 2015. This is a private practice devoted to both surgical and non-surgical spine care, with an emphasis on personalized patient care and service. As a team, they are able to analyze difficult cases together, and assist each other in surgery, bringing over 50 years of combined clinical practice to bear on challenging cases.